Groundhog Day, celebrated on the 2nd of February every year is one of the most popular traditions in the United States, also followed in Canada and Germany. It’s the day when the cutie patootie groundhog comes out of its hole to look for his shadow after a long winter sleep. If he sees the shadow, he takes it as an omen of bad weather and returns to the hole. This means the winter will persist for six more weeks. And if the day is cloudy, he takes it as a sign of spring and stays on the ground. This means the spring season will arrive early. We don’t know how accurate it is, but people usually consider it true. Kids, especially, take this day as an opportunity to indulge in some activity. Hence, we have come up with some free printable Groundhog Day coloring pages, worksheets and activity sheets for our readers. 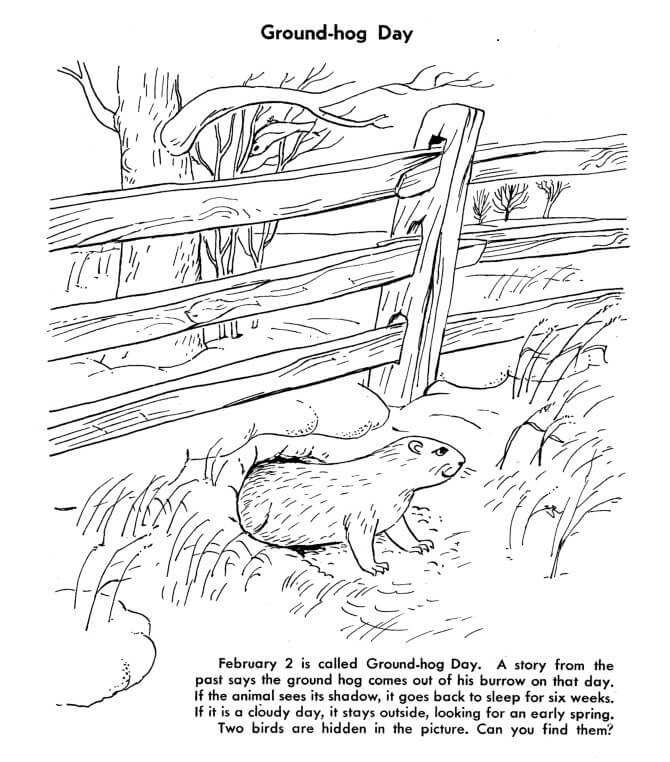 So check out the Groundhog Day coloring sheets below. Here’s an extremely cute Groundhog day coloring page for you to print out and color. It’s a cute scenery, with clouds, sun and trees behind. It seems that groundhog is finally ready to welcome summer. How smart is this groundhog looking? Is he trying to look up in the sun or is he setting his hair? Either way, it’s looking extremely sassy and cool, isn’t it? 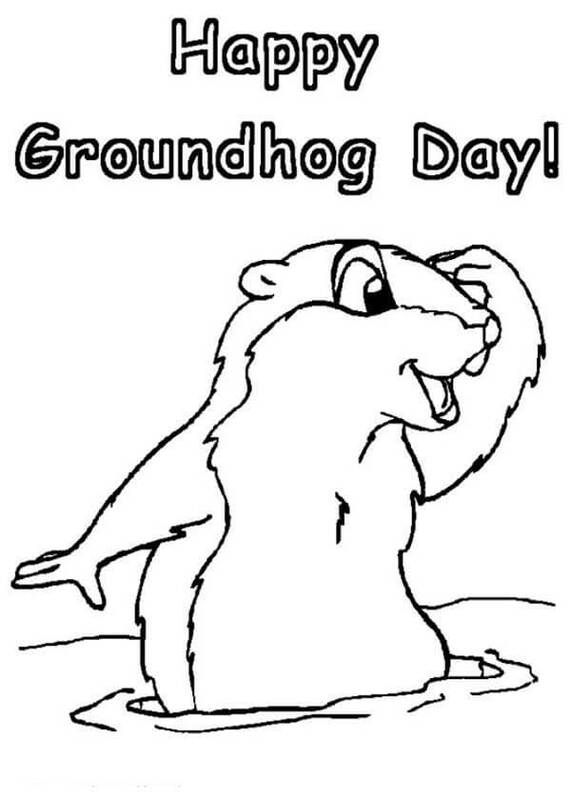 Here’s an informational groundhog day coloring page for you to print out and share with your friends. It shares the story behind the origin of Groundhog Day. 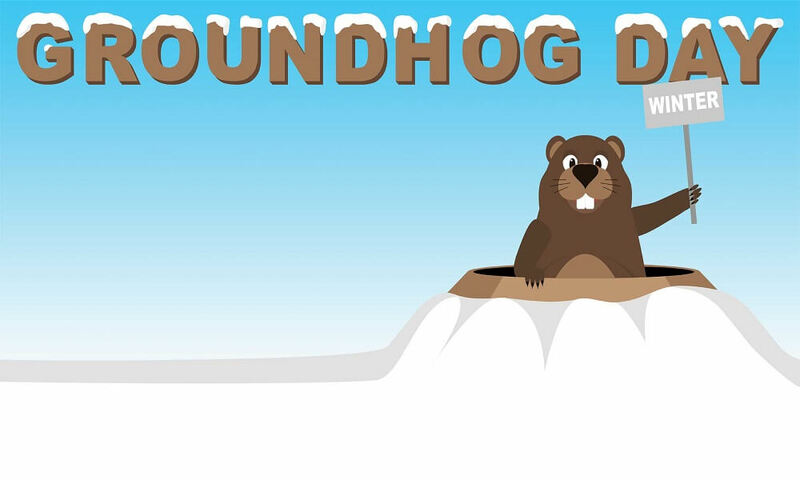 February 2 is considered the Groundhog Day as it’s said that the groundhog comes from its burrow on that day. If the groundhog sees shadow, it goes back to sleep for not one or two, but six weeks straight. If it’s a cloudy day, the groundhog stays outside to look for early spring. 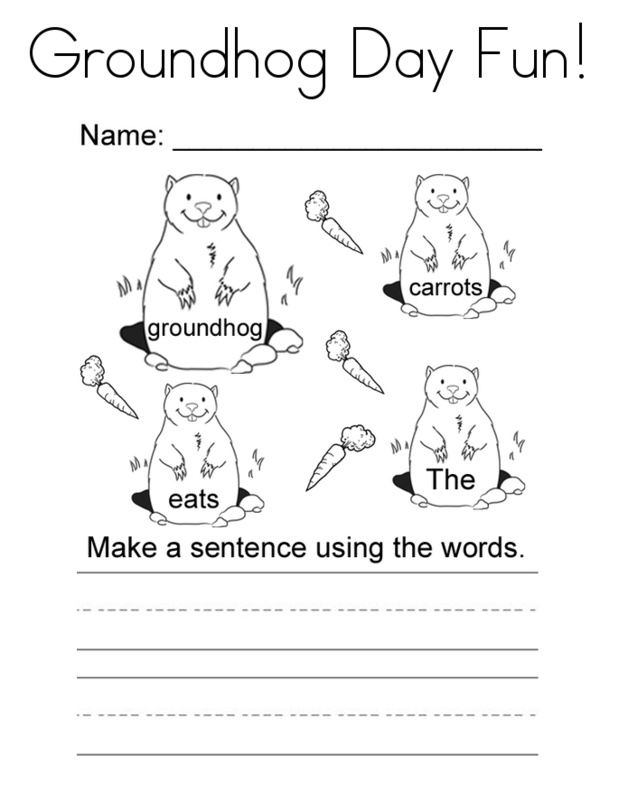 If you have a preschooler at home, this Groundhog Day worksheet would be perfect for him. 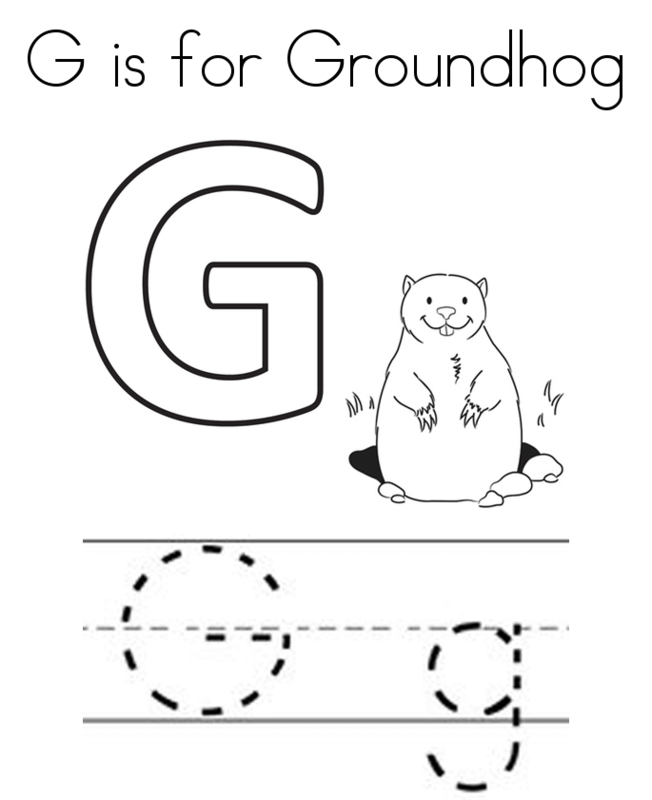 It highlights a black and white image of a groundhog, with the letter G in upper and lower case, which the kids need to trace and color. This coloring page is fascinating! It will test your child’s general knowledge, while giving him ample of fun. The color sheet introduces us to a groundhog and asks them what Grif the groundhog eats. There are a couple of options below, and children have to reply with yes or no. They can color the sheet after giving the answers. 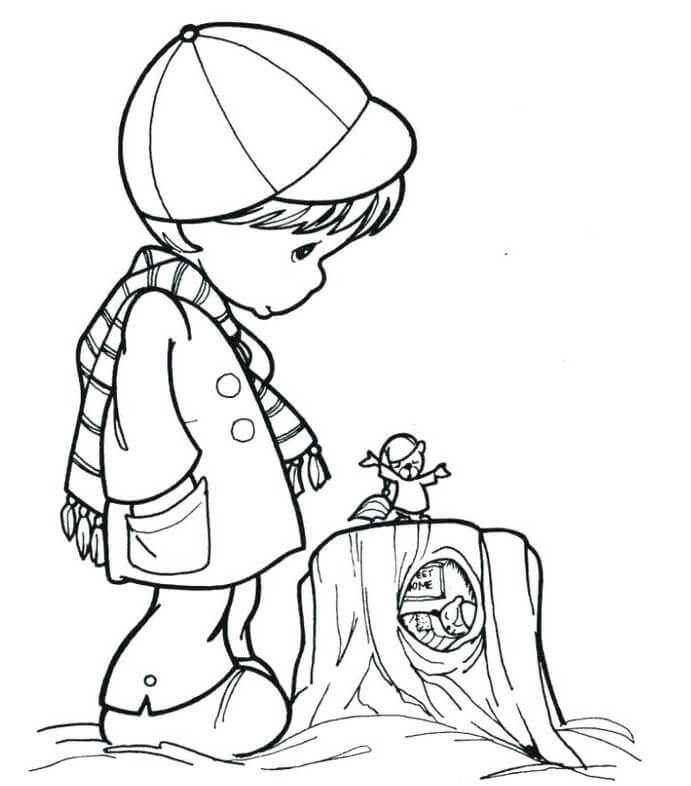 This coloring page features a young girl pointing out to a groundhog to her brother. It’s probably 2nd of February, and the groundhog has come out of his burrow to inspect the climate. What would be his next step? 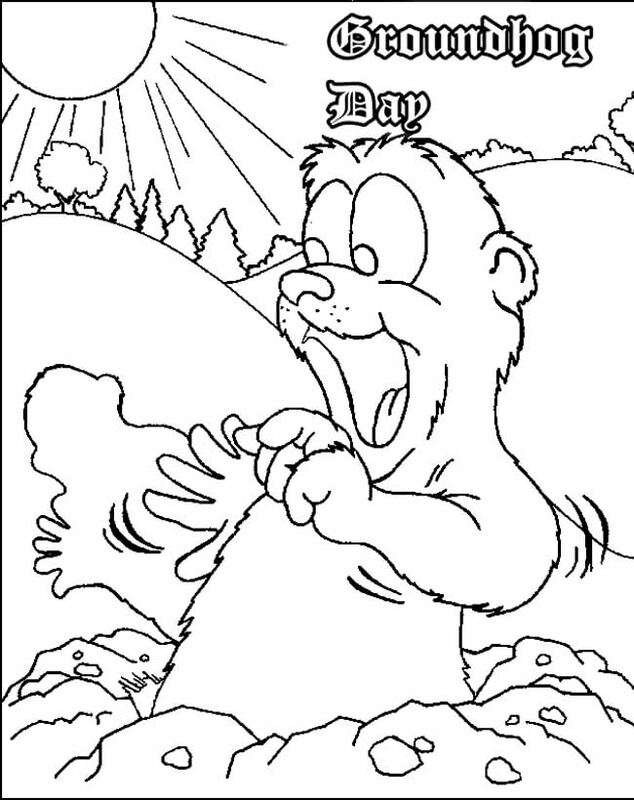 The groundhog in this coloring page has come out of its burrow and is delighted to see a sunny and bright day. We even love the little hat this young guy is wearing. 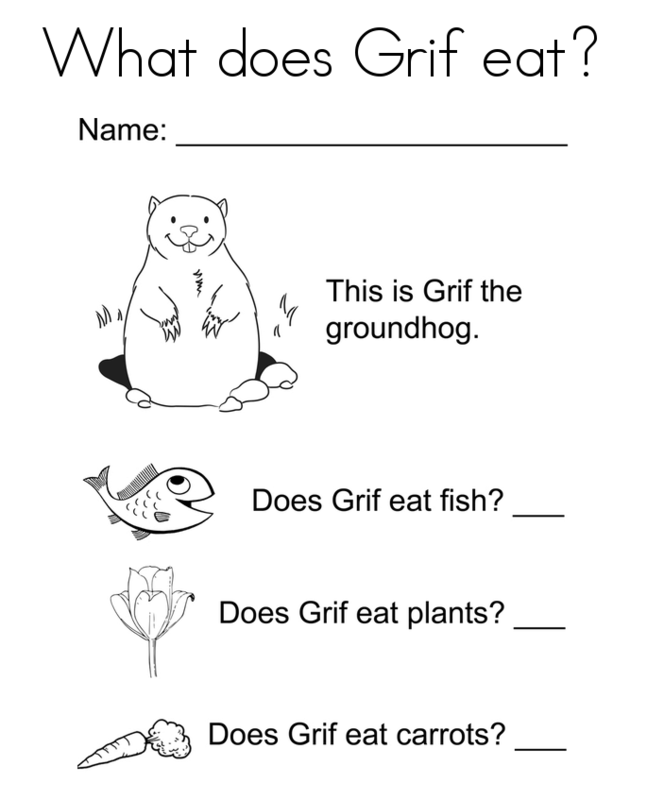 This is one of our favorite groundhog activity sheets for young kids. Children have to trace the words featured below each image and then color the images. They can even write their names on the activity sheet. 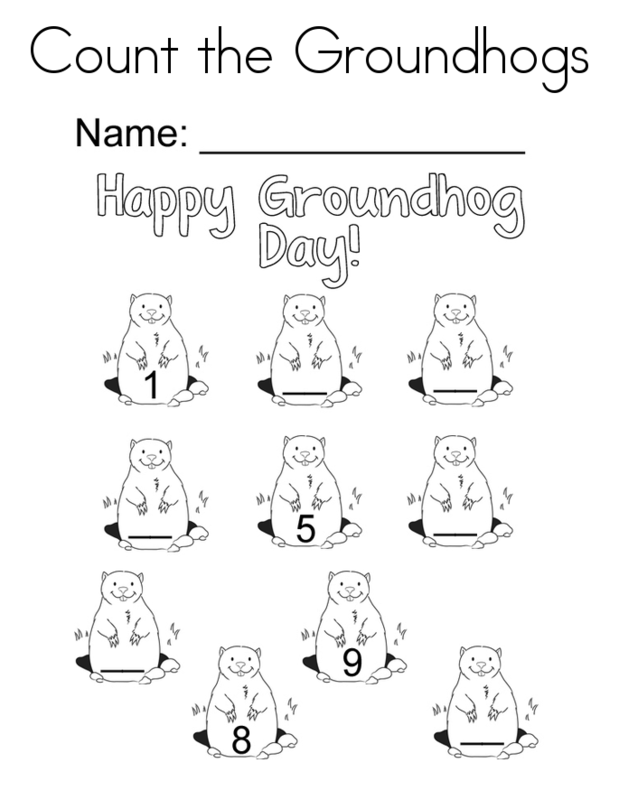 In this activity sheet, you have to ask your preschooler to count the groundhogs and write the number in the blank present on some of the groundhogs. They can color the groundhogs after counting anyway they like. How about making a groundhog puppet on the groundhog day? You need to print out the image on a construction paper and follow the instruction on the template. This is one of the most unique colors by instruction coloring page. Children have to follow the color guide on the image to paint this cute groundhog. What do you all think? 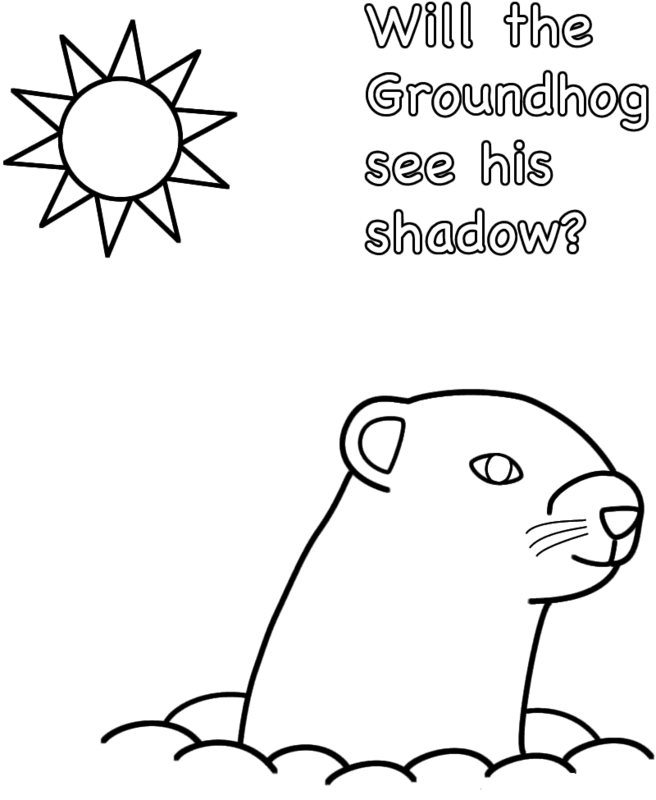 Will the groundhog in this coloring sheet see his shadow? Or will he go back to sleep again? Write a story to go with the picture and then color the image. This groundhog has seen his shadow, and his happiness knows no bound. It means that he will go back to his den to sleep for a few more weeks. He looks happy anyway, but will look even better when he’s given some color. Would you oblige him? 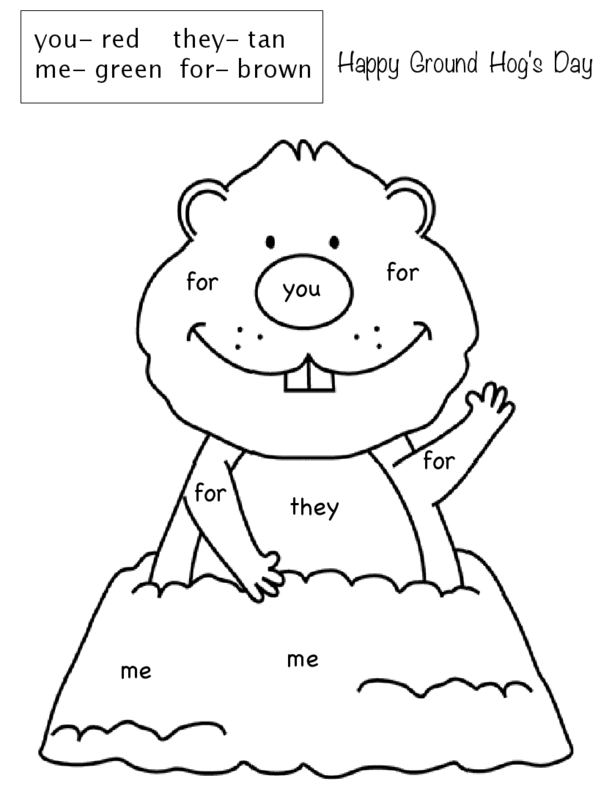 Have some fun with your preschooler on the groundhog day by making his complete this worksheet. You need to ask your child to make a sentence using the words on this worksheet. After completing the worksheet, they can color the images. 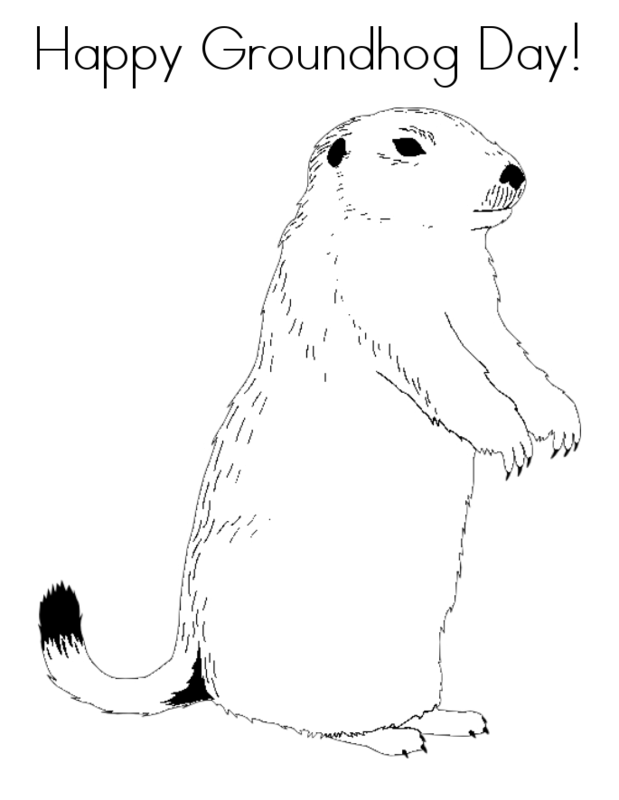 Here’s a simple Groundhog Day coloring page featuring a realistic image of a groundhog. We’d suggest you try shading on this coloring page to make it stand out. 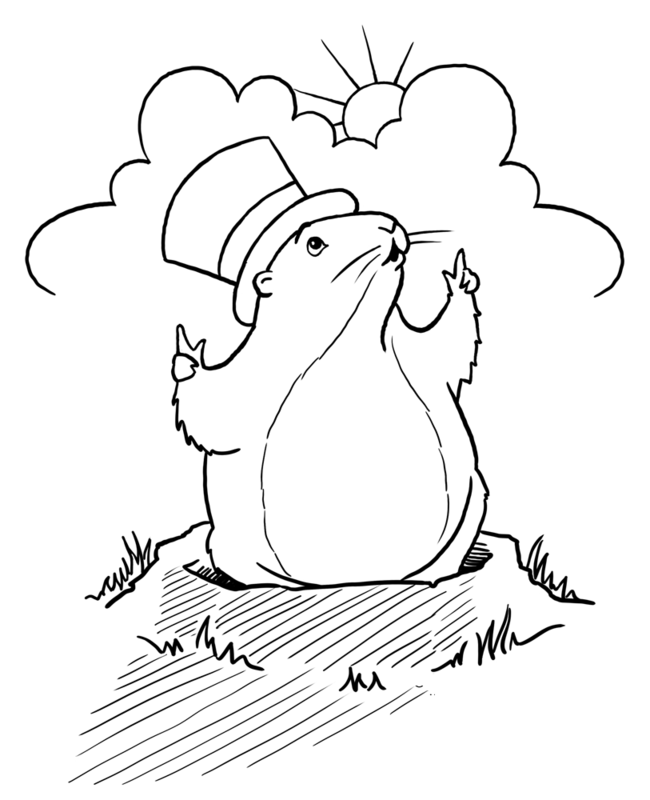 Here’s another adorable groundhog day coloring page featuring a groundhog looking out for the clear clouds. Here’s another pompous coloring page featuring three little groundhogs wishing you all a very happy Groundhog Day. Here’s another adorable Groundhog Day special coloring page, featuring the little child from Precious Moments. 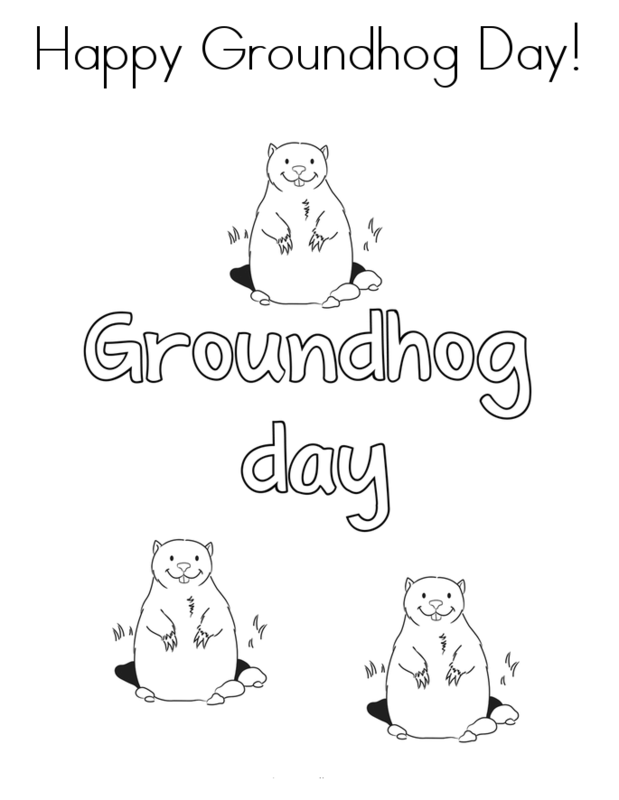 Hope you liked our compilation of free printable Groundhog Day coloring pages. Print out each one of them to create a Groundhog coloring book. You can even check out our Mardi Gras coloring pages in your free time. ScribbleFun is a coloring page aggregator, providing latest movie and television show coloring pages. Apart from movies and television shows, we also have thousands of educational and holiday themed coloring pages and work sheets. We, at Scribblefun, have no intention of infringing your copyright, artistic rights or legitimate intellectual rights. The images found in our articles are believed to be in ‘public domain’ or are of unknown origin. If the RIGHTFUL OWNER does not want their work displayed here or want credit, feel free to contact us. Furthermore, the content of this site is free and ScribbleFun does not charge users for downloading or printing images or wallpaper.